Do you need a garage door fixed or installed? This guide will walk you through everything you need to know about garage doors and how much you can expect a repair or installation to cost. Garage doors are heavy, bulky, and require proper installation to function safely. If you need help, feel free to give Roofing Roger a call at 910-302-5262. 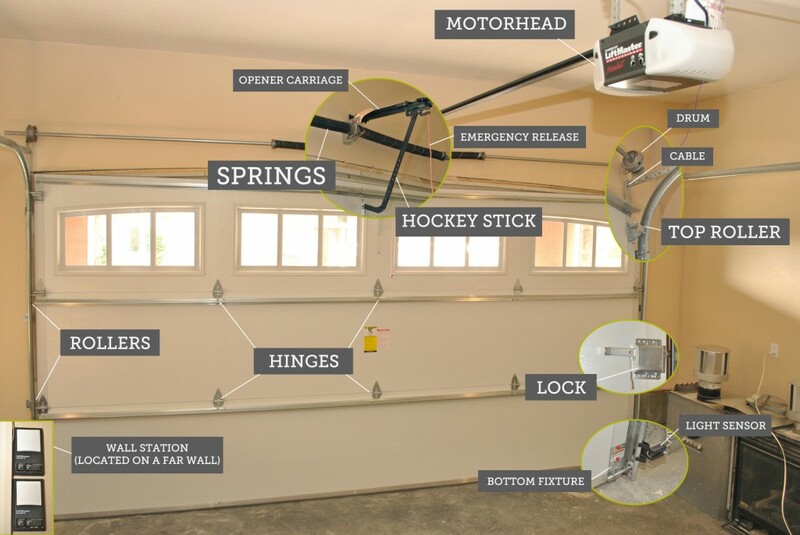 Garage doors usually have the following parts: the door itself, tracks, a torsion spring, steel cable, brackets for the spring, and an optional opener. Door – this part is the door itself. It can be made from vinyl, steel, wood, or composite wood. It can be insulated or not. If installing in a garage that’s attached to a house, insulation is recommended. It can have windows as well, for lighting and decoration. Tracks – this is what the door rides on. Torsion spring – this is a spring that helps the lift the garage door. It is unwound when the door is lowered to store energy. When the door is raised, the spring helps lift the door up. Cable – this connects the door to the opener. Brackets – this connects the cable to the opener and the door. Opener – this is the motor that pulls the door up and, usually, comes with a wireless remote. This part is optional as a manually opened garage door works just fine. Roll up – also called sectional. This is the most common type and goes up in panels. Sliding – this door slides left or right and is often seen on barns. Swing up – this door has no panels and goes up in one whole piece. Swing out – this door opens from the center like a double door in one’s house. The national average for a new garage door, including installation is $1,061. The middle 50% price range was between $742 and $1,413. This means that you have a 50% chance of having your garage door project cost between those two amounts. This number came from a sample size of 6,210+ projects. The average for North Carolina is close by at $1,143. The middle 50% is between $854 and $1,456. It is not recommended to install a garage door yourself as they are usually very heavy. Either get help or hire a professional. Also, improper installation can result in injuries. Often times, garage doors need to be fixed. The motor might be fried, the spring might have worn out, the brackets might have worn out, or the door itself has suffered too much wear and tear. The average cost for a garage door repair in the US is $209. The middle 50% is between $148 and $319. The average price for a repair in NC is $230 with the middle 50% between $156 and $322.